There aren’t too many joys in this world quite like waking up on Christmas morning, checking under the tree and finding a crisply wrapped box that stores a fresh new pair of sneakers. You know … the ones your mama swore she wouldn’t get you, so you asked Santa, just in case. On Tuesday, players hooping as part of the NBA’s loaded schedule of Christmas Day games will experience a similar moment. For them, it’s the sneaker companies with which they’ve inked endorsement deals that play Santa, presenting their brand ambassadors with special-edition shoes to celebrate the holiday season. Before games, boxes await at lockers, ready to be laced up and taken for a spin. From traditional red-and-green colorways to designs incorporating Dr. Seuss’ Grinch, there are truly no limits on holiday kicks designs. Shoes have steadily become more and more complex, and more festive, as the ritual continues to grow and spread joy throughout the league. 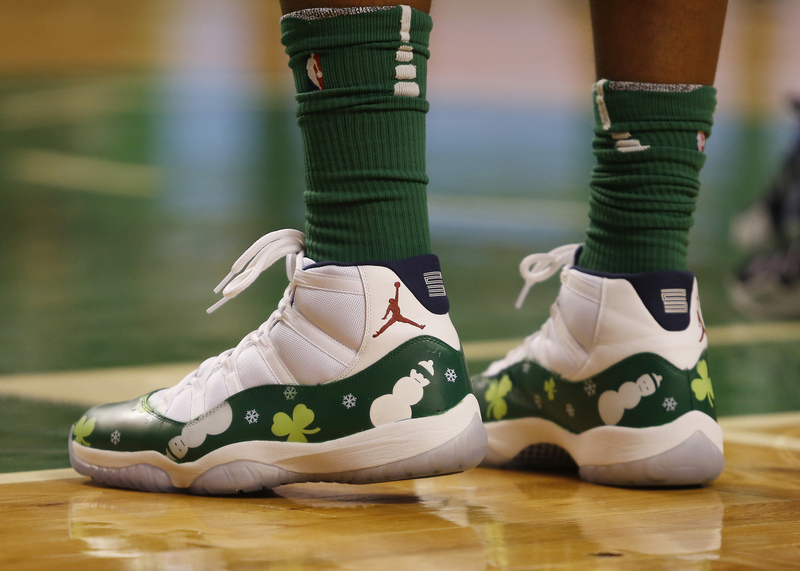 Starting with Michael Jordan’s Air Jordan 13s in 1997 and ending in 2017 with an icy pair of custom Air Jordan 11s, featuring snowflakes and snowmen, sported by Marcus Morris, these are the top 50 sneakers worn on the past 20 NBA Christmas Days. 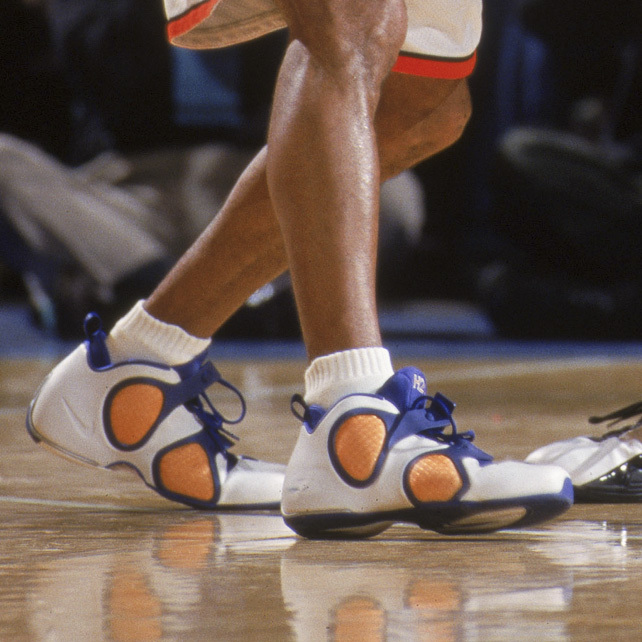 On Christmas Day 1997, when Michael Jordan wore the white, true red and black edition of then newly released Air Jordan 13, these shoes had yet to take on their true identity. 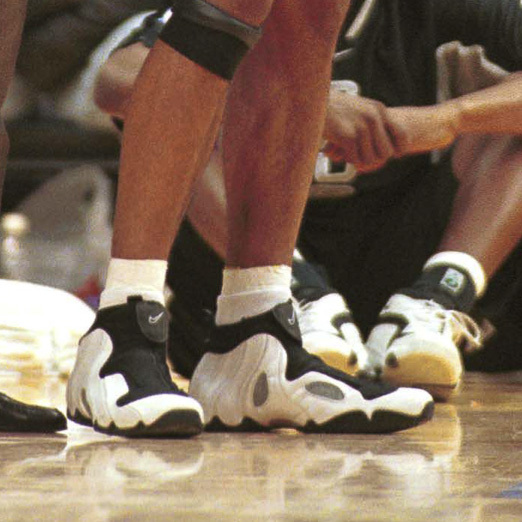 After the May 1998 release of the Spike Lee-directed coming-of-age New York hoops flick He Got Game, which featured Denzel Washington famously donning the kicks under a house arrest ankle bracelet, they came to be eternally known as the “He Got Game” 13s. Jake Shuttlesworth, Washington’s character, would’ve appreciated Jordan’s 24-point performance in a win over the Miami Heat while wearing the shoes. The NBA experienced its third lockout from July 1, 1998, to Jan. 20, 1999, as the league and its players union negotiated a new collective bargaining agreement. As a result, the 1998-99 season was shortened to 50 games, and didn’t begin until Feb. 5, 1999. No Christmas games meant no Christmas heat on players’ feet. Future Hall of Famer Tim Duncan spent his first six years in the league lacing up Nikes, and, boy, did he have a lot of dopeness to work with in that era. 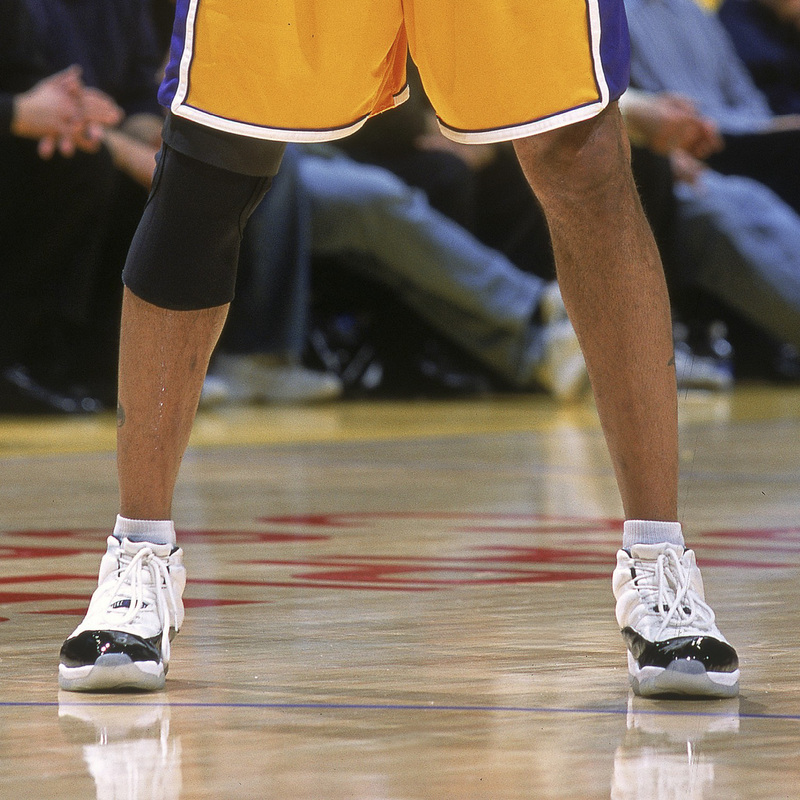 Duncan wore everything on the court from the Nike Foamposite One to the Total Air Foamposite Max, and of course his Air Max Duncan and Air Max Duncan 2. In 1999, he led the Spurs to victory in the biennial McDonald’s Championship, a now extinct international pro basketball cup, while sporting Nike Air Flightposites. Two months later, he dropped 28 points in them on Christmas. Duncan’s Nike days ended in 2003 when he signed with Adidas, the company with which he’d finish out his career. You could certainly tell that Ron Harper was a former teammate of Jordan’s on Christmas in 2000. 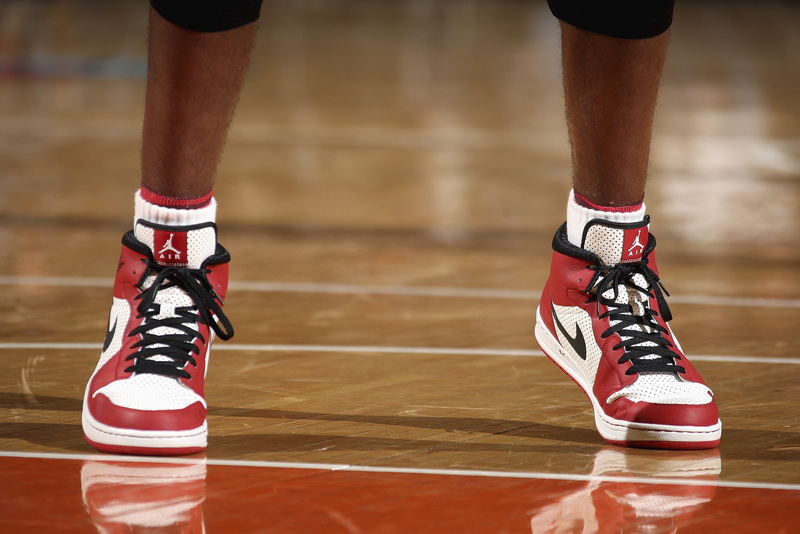 In a game against the Portland Trailblazers, Harper, who played with the greatest of all time on the Chicago Bulls from 1995 to 1998, rocked a pair of “Concord” Air Jordan 11s, which first retroed in 2000. Meanwhile, Harper’s young superstar teammate, Kobe Bryant, broke out a silver pair of his signature Adidas Crazy 1, which features a silhouette inspired by an Audi. Kobe Bryant’s 2010 Nike Zoom Kobe 6s, inspired by the grumpy green Dr. Seuss character, are the greatest Christmas Day sneakers the NBA has ever seen. A player exclusive (PE) pair of Nike Flightposite IIIs in Knickerbocker white, orange and blue? Santa Claus (or Nike for the nonbelievers) sure did look out for Allan Houston, who dropped a game-high 34 points in a Christmas win over the Toronto Raptors. A matchup within a matchup. The Los Angeles Lakers vs. the Sacramento Kings in X’s and O’s, and Kobe Bryant vs. Mike Bibby in sneakers. 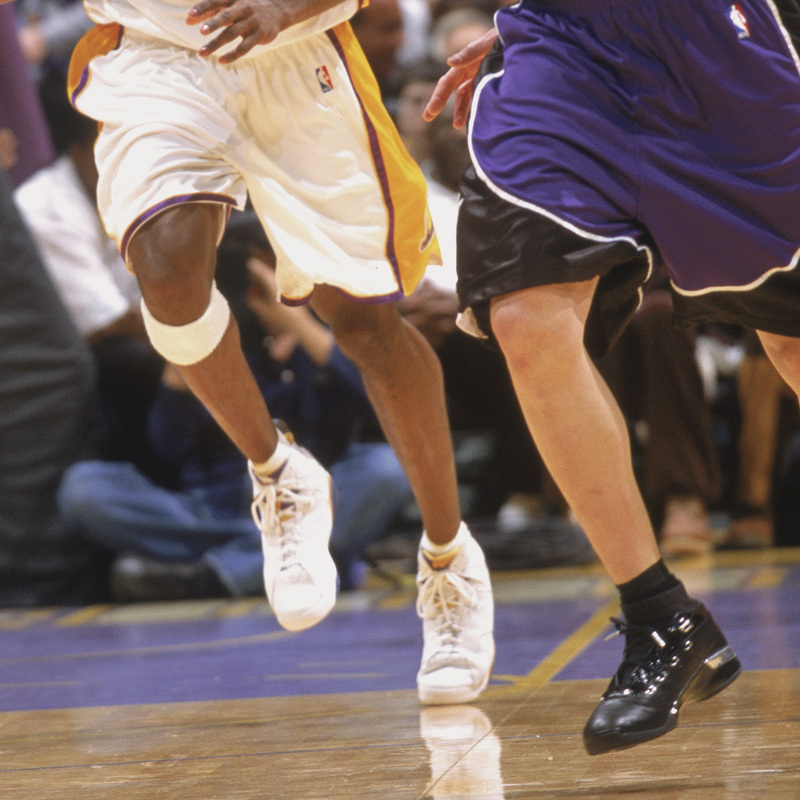 Bryant, a sneaker free agent in 2002 after parting ways with Adidas, wore a pair of white, purple and gold Air Jordan 7 PEs, while Bibby, a member of Team Jordan since 1999, swagged the OG black and metallic silver Air Jordan 17s. Bibby’s Kings beat Bryant’s Lakers, but which player won the clash of kicks? 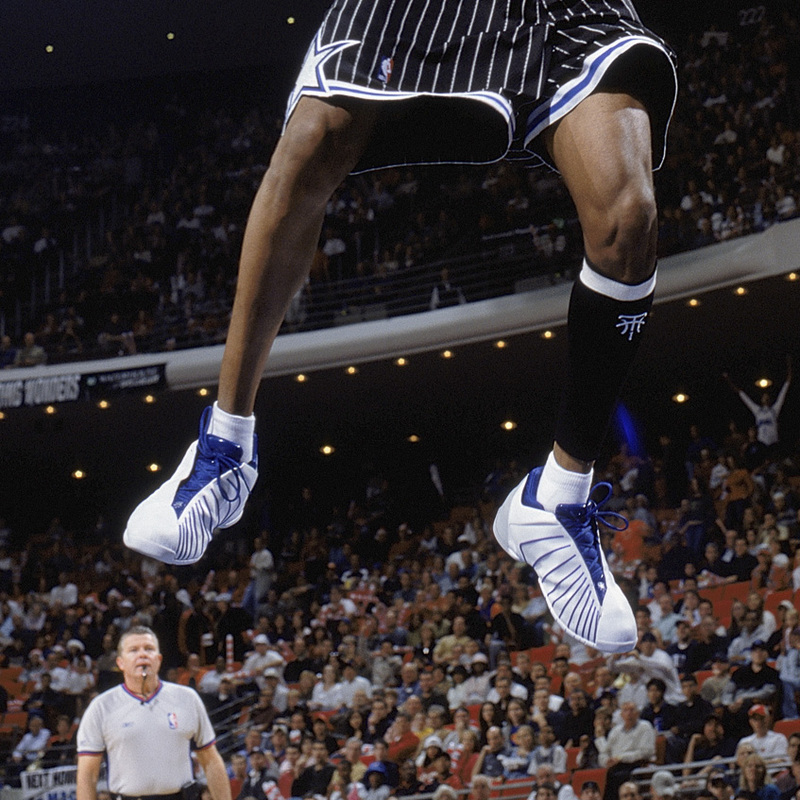 A throwback Orlando Magic pin-striped uniform with a pair of striped Adidas T-Mac 3s — some next-level Christmas coordination from Tracy McGrady. In a 41-point afternoon against the Cleveland Cavaliers, McGrady teased the T-Mac 3s, which wouldn’t drop at retail until 2004. Another display of yuletide sneaker competition, this time among members of the same team. 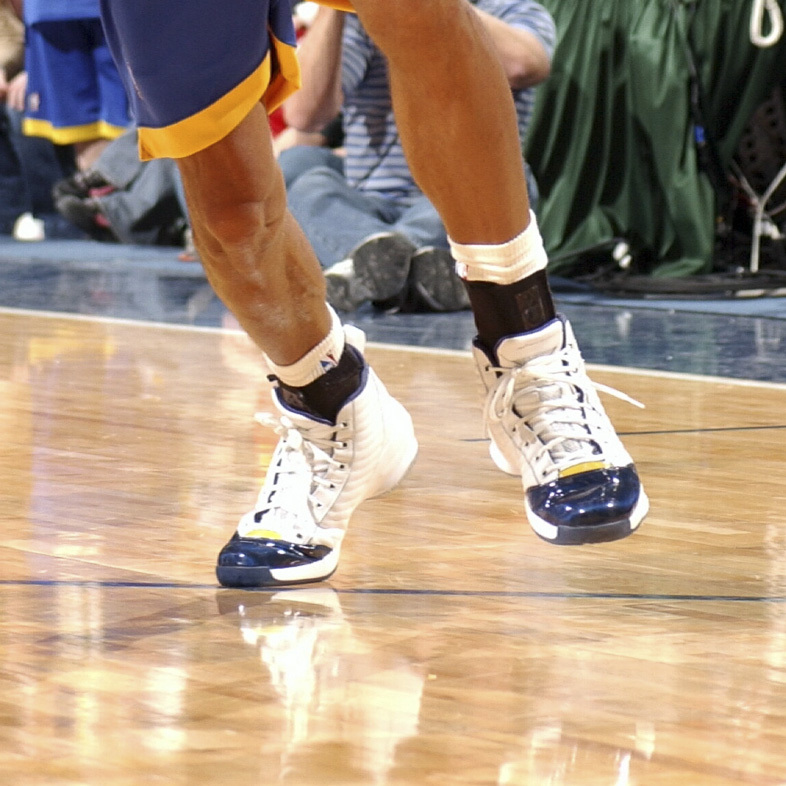 Reggie Miller clearly took matching his shoes with his Indiana Pacers uniform to heart. Against the Detroit Pistons, he wore a special edition pair of white, metallic gold and midnight navy Air Jordan 19s, while his teammate Fred Jones went super festive and classy with a pair of “Wheat” Air Jordan 13s. Two strong pairs of shoes to have under the tree. Moral of the story: Christmas Day in the NBA is too epic for some players to wear just one pair of shoes. Why not close out 2005 by wearing Nike Air Zoom Huarache 2K5s, the best performance basketball shoe of the year? That’s exactly what Lakers teammates Kwame Brown, Lamar Odom and Smush Parker did in a road matchup against the Miami Heat on Christmas. 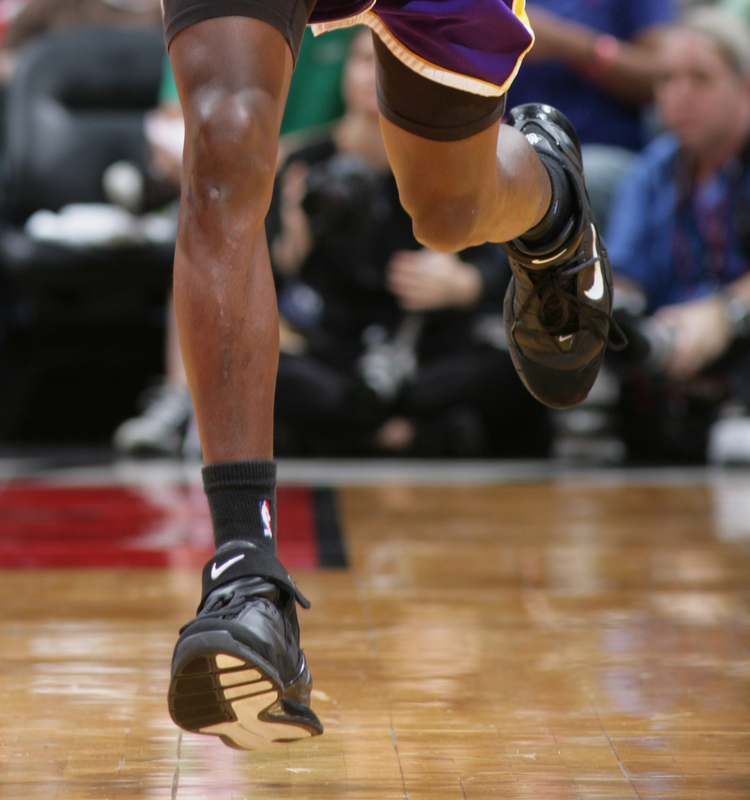 The trio complemented their dark purple road uniforms with all-black 2K5s. In June 2006, Dwyane Wade delivered the Miami Heat their first championship in franchise history while rocking his signature Converse sneakers for the entire six-game series that ended with the shooting guard hoisting the Bill Russell Finals MVP trophy. 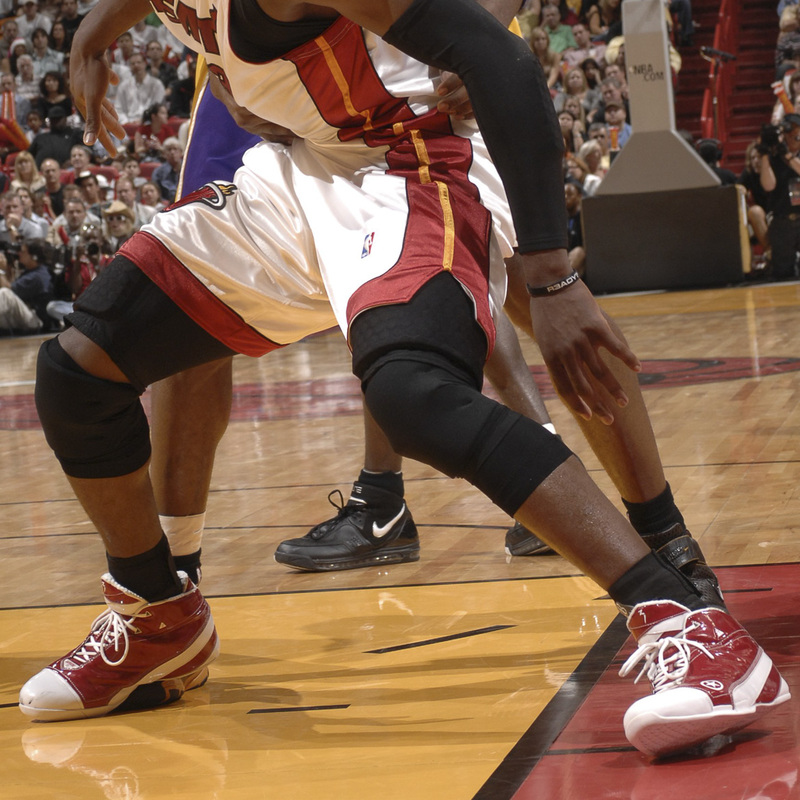 Six months later, in a matchup between the Heat and Lakers (the NBA’s only Christmas game of 2006), Wade delivered again with 40 points while still rocking Converse — this time a pair of red and white Wade 1.3s that he debuted in the blowout Christmas day win. Santa Claus must’ve forgotten to pay visits to the six teams that starred in the 2007 Christmas Day games, because the sneaker heat of Christmas past went missing that year. The only shoes of note in ’07? 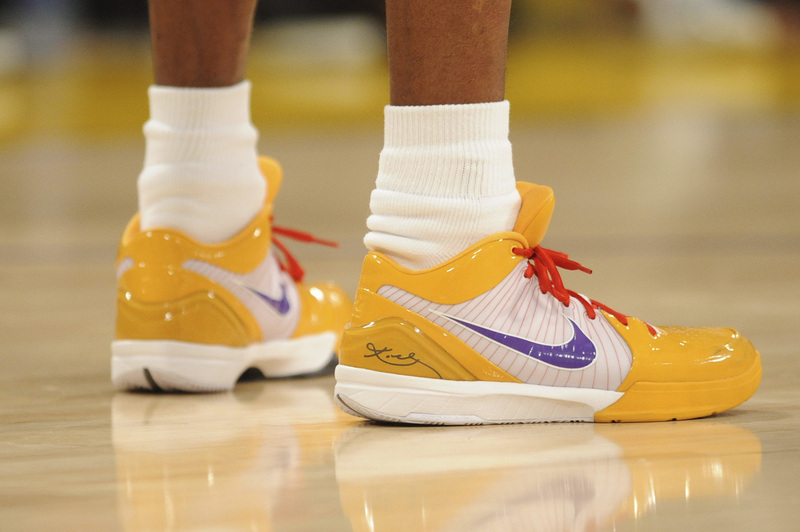 Bryant’s high-top Nike Kobe 3s in Lakers colors. These shoes set the tone for many Christmases to come — absolute fire. This is where all the fun, and Christmas cheer, truly begins. By 2008, the NBA started showcasing a full slate of Christmas Day games. A bigger holiday stage sparked a movement among players and sneaker companies to seize the moment in style with vibrant-colored kicks designed through the lens of specific themes. Bryant wore a personalized edition of his Zoom Kobe 4s, and Nike also presented 100 fans with custom pairs of the shoes. LeBron James debuted his Nike Zoom LeBron 6s, inspired by his chalk-throwing ritual before tipoff of games. And Dwight Howard channeled his alter ego, Superman, in special Adidas TS Bounce Commanders. Bryant, James and Howard became the early adopters of a Christmas tradition that’s still practiced across the league today. 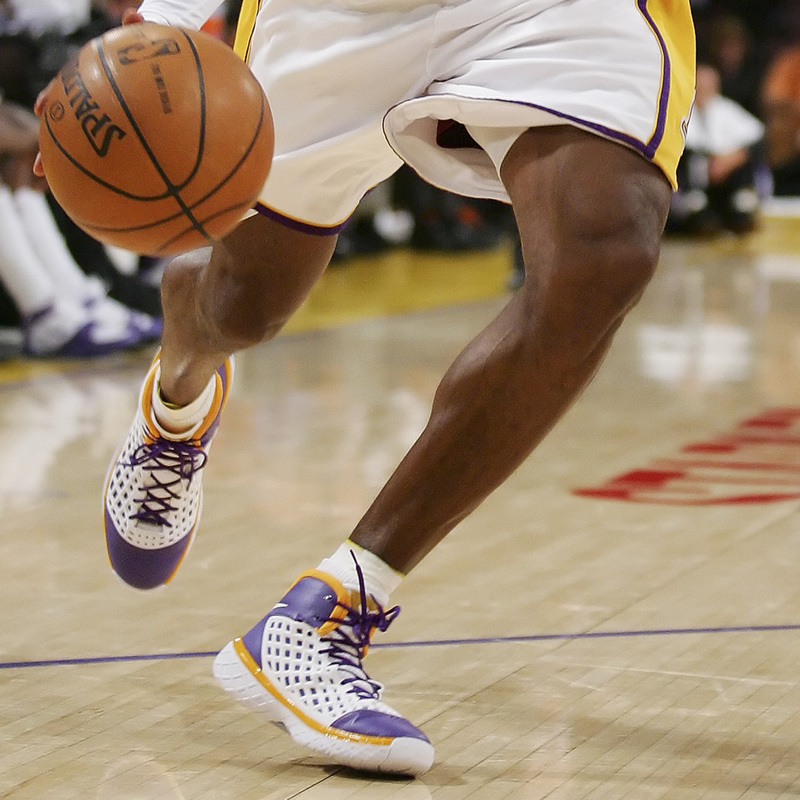 Christmas “Chaos” for Kobe in his fifth signature Nike shoe. Old school meets new school in the Air Jordan Alphas, worn by longtime Team Jordan member Ray Allen and Dwyane Wade, who left Converse in 2009 to sign with Jordan Brand. 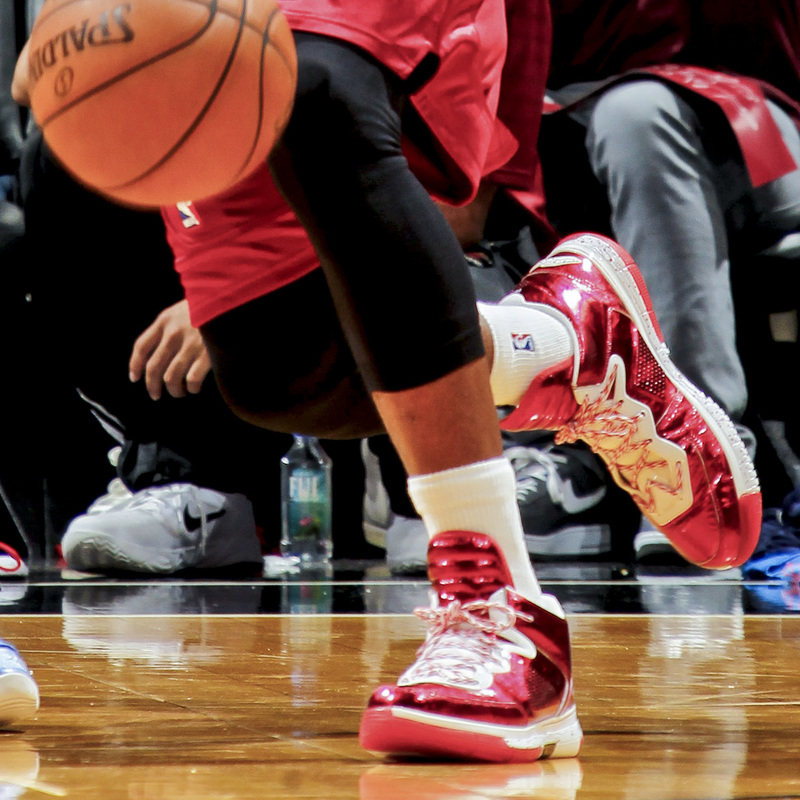 Anthony Carter in the Christmas green and red Blazers, and J.R. Smith with a cherry on top in the red-accented “Cherry” Air Jordan 12s. HOLIDAY HOT TAKE ALERT: Universal Pictures’ The Grinch, released in 2000, is the greatest Christmas movie of all time, and Bryant’s 2010 Nike Zoom Kobe 6s, inspired by the grumpy green Dr. Seuss character, are the greatest Christmas Day sneakers the NBA has ever seen. Neither declaration is up for debate. Cheetah print for Bryant and copper for Durant? James wasn’t about that noise. 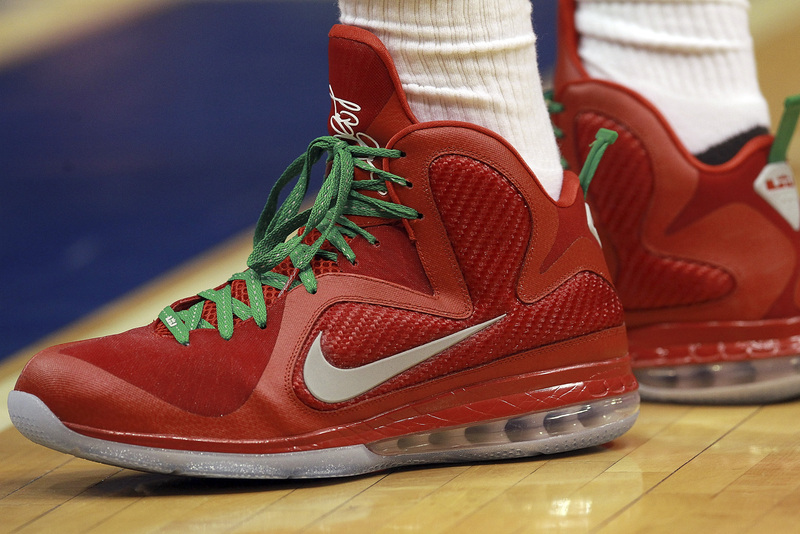 He and Nike represented the holiday to the fullest, with classic red and green on his 2011 Christmas Day kicks. In 2012, Miami Heat teammates Allen and Wade had the same idea: Wear one pair of Christmas-themed shoes in the first half, and another pair in the second. 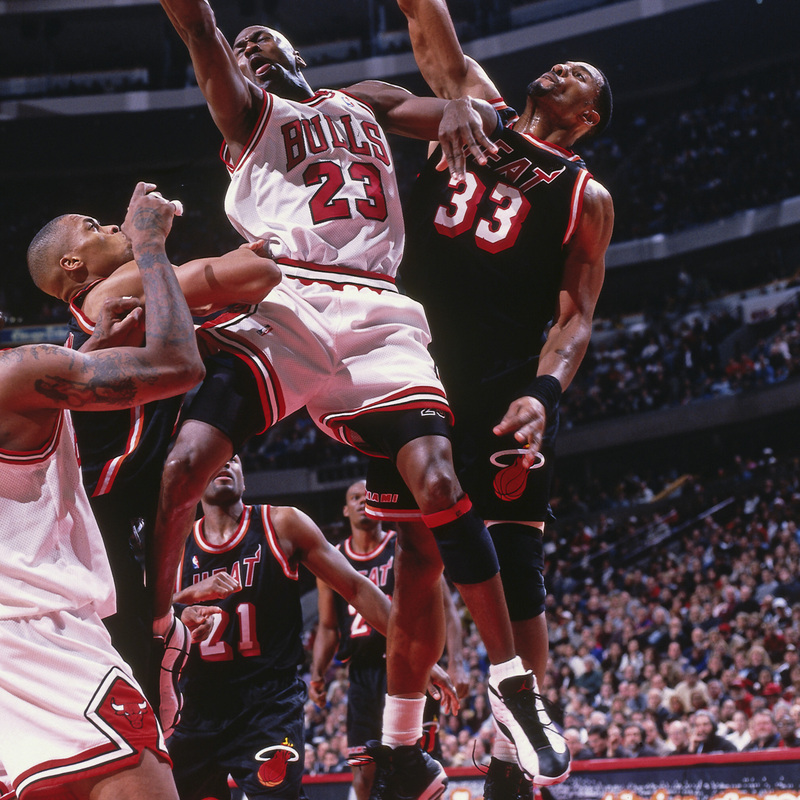 Allen pranced up and down the court in two pairs of red-and-green Air Jordan PEs — first in the 18s and then in the 20s. Meanwhile, Wade broke out two shiny pairs of his signature Li-Nings. Moral of the story: Christmas Day in the NBA is too epic for some players to wear just one pair of shoes. Santa Claus (or Nike for the nonbelievers) sure did look out in 2001 for Allan Houston. Two shades of Christmas green on the feet of two of the “Heatles.” Teal for James, with red trim and snowflake graphics. Lime green for Wade, with red accent and a speckled pattern resembling the skin of our favorite holiday hater, the Grinch. The question is, did Wade and Li-Ning swagger-jack the Black Mamba and Nike’s iconic “Grinch” Kobe 6s? 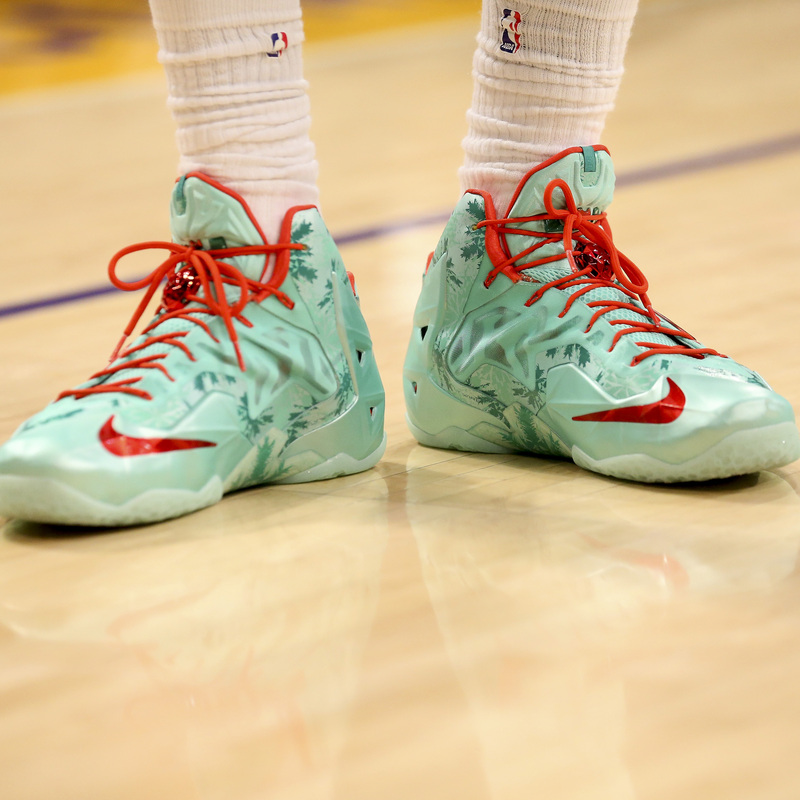 Regardless, the Grinch is the gift that keeps on giving when it comes to Christmas kicks. 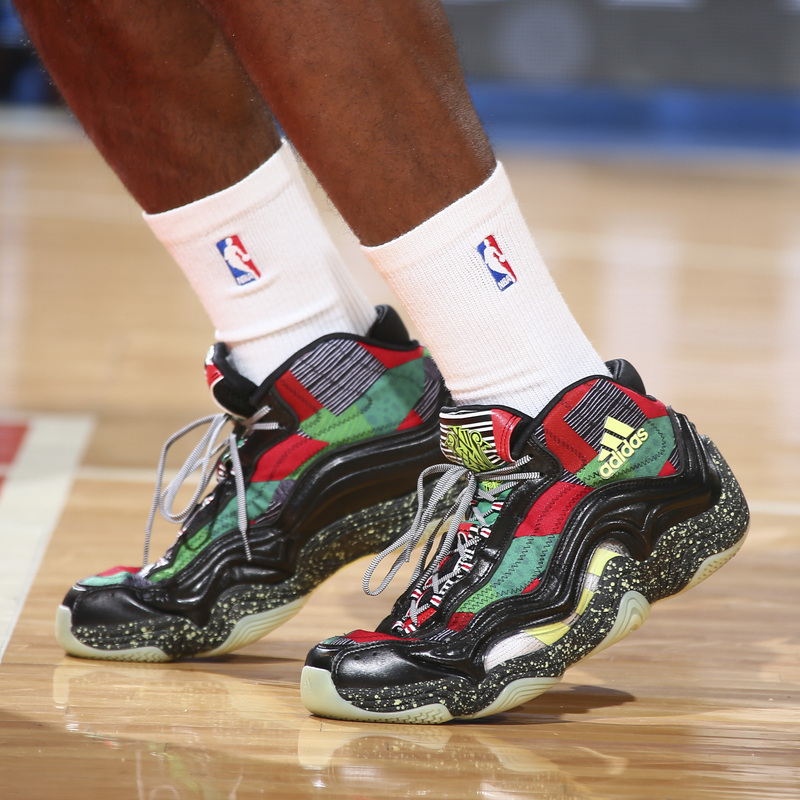 To celebrate 2014’s five Christmas Day games, Adidas unveiled the “Bad Dreams” collection, featuring four sneakers designed in funky colors and patterns, and all highlighted by glow-in-the-dark soles. The best pair? The Crazy 2s, worn by Iman Shumpert in pregame warmups, even though he didn’t suit up for the Knicks’ matchup with the Washington Wizards due to injury. Honorable sneaker design mention: Klay Thompson’s Nike Hyperdunk 2013 PEs, which featured a snowman holding a basketball on the tongue of each shoe. 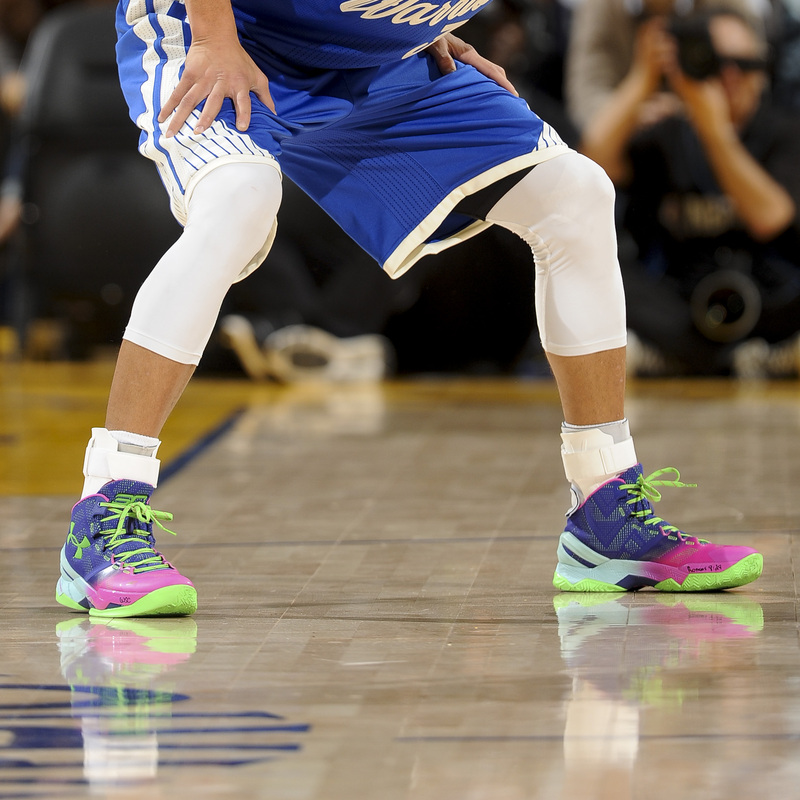 Chef Stephen Curry in the “Northern Lights,” boy! Seriously, these colorful concoctions could be worn for any holiday in the calendar year, not just Christmas. *Cue up the Gucci Mane* I’m icy, so m—–f—— snowed up (“Icy,” 2005). 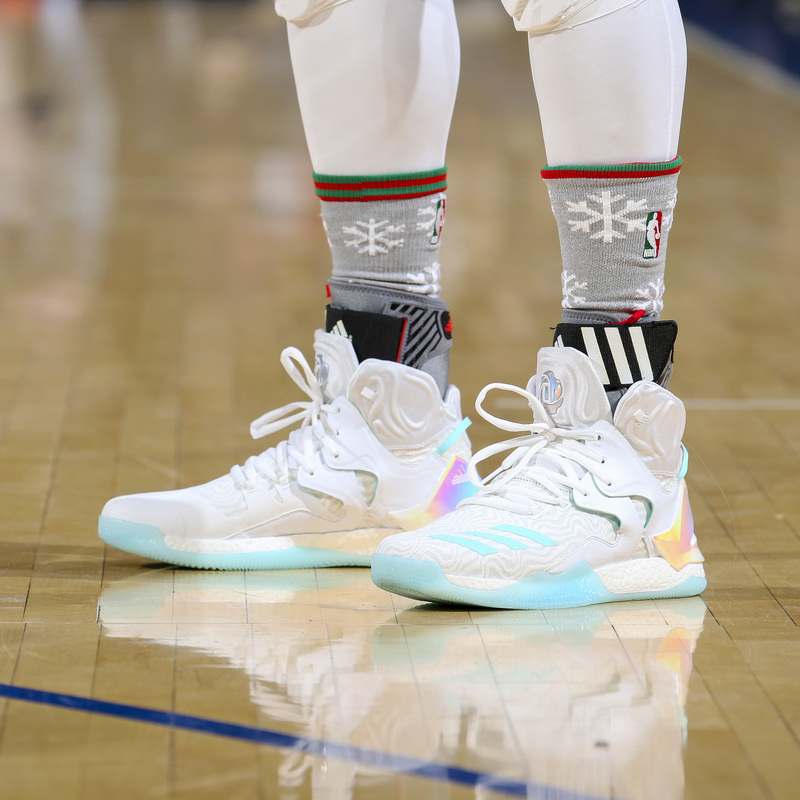 Derrick Rose certainly brought both the ice and the snow on his kicks for a Christmas Day game during his lone year with the New York Knicks last season. The way those colors hit the light, you’d swear Rose was hooping on the blacktop in an ice storm, not on the hardwood in the Garden. It was the year of Christmas customs in 2017. Minnesota Timberwolves big man Karl-Anthony Towns and Golden State Warriors enforcer Draymond Green each unveiled uniquely painted pairs of Nike Hyperdunks, featuring a few of our favorite childhood characters in The Grinch and Arthur. But the player who stole Christmas with his kicks was Marcus Morris of the Boston Celtics. The 6-foot-9-inch forward commissioned Philly sneaker artist Swaggy L to craft a pair of Air Jordan 11s, highlighted by a green mudguard embossed with snowflakes, snowmen and shamrocks. A shout-out also goes to Nick Young and LeBron James for being in their sneaker (Santa) bags last season. Young paid homage to the legendary Tracy McGrady with a player exclusive, mismatched pair of blue and gold Adidas TMac 3s. And James strayed away from Christmas red and green, deciding instead to go pink — with the Nike x KITH LeBron 15 collaboration. Who in the NBA will gift us with this year’s best sneakers (especially since the league lifted color restrictions on player footwear)? We’ll see what Giannis Antetokounmpo, Stephen Curry, Kevin Durant, Joel Embiid, James Harden, Kyrie Irving, LeBron James, Donovan Mitchell, Ben Simmons, Russell Westbrook and Santa have wrapped up and ready to go for a Christmas Day complete with hoops.